The APRL received an exceedingly rare non-philatelic book as a donation, and is offering it for sale on eBay. Proceeds of the sale will benefit the APRL. 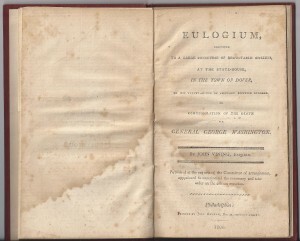 The book is a eulogy for George Washington given on his birthday, February 22, 1800, by John Vining at the Delaware State House in Dover. It was printed as a 20-page pamphlet by John Ormrod in Philadelphia, and later bound with gold lettering on the spine. John M. Vining (1758-1802) was a prominent American Lawyer and politician from Dover, Kent County, Delaware. He was a Continental Congressman (1784-86) and, as a member of the Federalist Party, served in the Delaware General Assembly and as U.S. Representative and Senator (1789-98). Vining was described as handsome, friendly, hospitable and generous, but, tragically died, most likely from alcoholism, at 43, just two years after delivering this address. An internet search of the internet found this book to exist in only a few archives with no sales on record. Condition is remarkably very good, despite water staining on first six pages, normal toning due to ink of the time, sensibly bound with board and red cloth, probably in the early to middle 20th century.